Nothing ever got better without changing. But change can be painful, confusing and emotional for those involved. With careful handling, negative reactions and harmful consequences can be avoided. We have developed a route plan to help you through your changing times that alerts you to the risks, and prepares you for the unexpected. The change, expect an emotional reaction, ranging from avoidance, confusion, apprehension and uncertainty to excitement. Resist the reality and hope it goes away. “I’ll be okay” It won’t affect me” “I’ve heard it before”. Head buried – work harder, avoid the issues deny the inevitable! Position, skills, knowledge, status have gone. Fear and fall into the trap of blaming everyone – ‘they’ the bosses, the economy, friends, family and even self. Angry, undervalued, out of control and not taking responsibility. Good looking ahead days and bad, everything is in a spin, counterproductive and pointless days. Constant churn, want to fit in but not knowing quite what or how. Starting to go forward, makes more sense, clearer, more controlled and planned. Scared, or is it excitement? Embrace mistakes – expect too much and it’s back to the washing machine. The jigsaw puzzle is coming together and the start seems a long way away. Confidence is increasing and you feel more like the old you, but different! When people don’t understand the context for change and the new direction, chaos ensues. People stay in ‘ostrich’ and ‘victim’ mode for longer with a real danger of this becoming a breeding ground for rebellion. Your own people will attempt to sabotage your business and your reputation. These people interface with your customers every day! People get stuck in ‘washing machine’ where delivery and morale is at its lowest. The implementation takes longer and costs more. Your best people will leave, whilst poor performers stay and fight. Out-moded behaviours prevail and your customers go elsewhere. 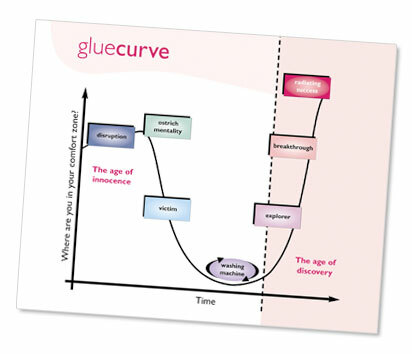 Download the gluecurve PDF here.